The Fly Ranch, located in Hualapai Flat, is home to several geysers. 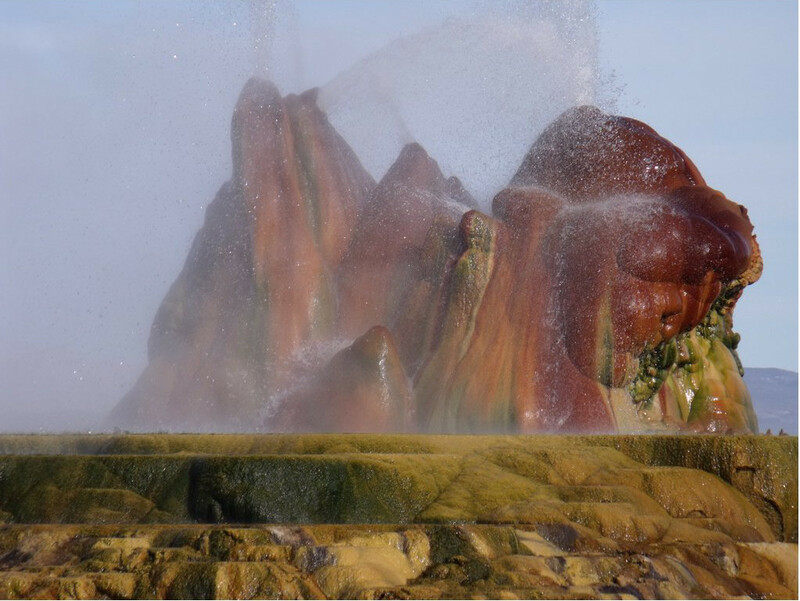 The most impressive one, Fly Geyser, was created by accident, making it a rarity in of nature. Even though it’s likely one of the best sights Nevada has to offer, even Nevada residents are not aware of the beauty in their back yard. Almost 100 years ago, in 1916, a well was drilled in an attempt to make the land fertile for farming. The drilling reached boiling geothermal water, of over 200 degrees. The geyser was abandoned since the water was no good for irrigation. Over the years, a calcium carbonate cone was formed around the geyser, measuring up to 10-12 feet. Almost 40 years ago, in 1964, a geothermic energy company decided to make a test well in the same location, several hundred feed from the first geyser. They struck the same 200-degree water, which was hot, but not nearly enough for what they needed. When this geyser was created, it took away from the water pressure of the first one, which is now dried. 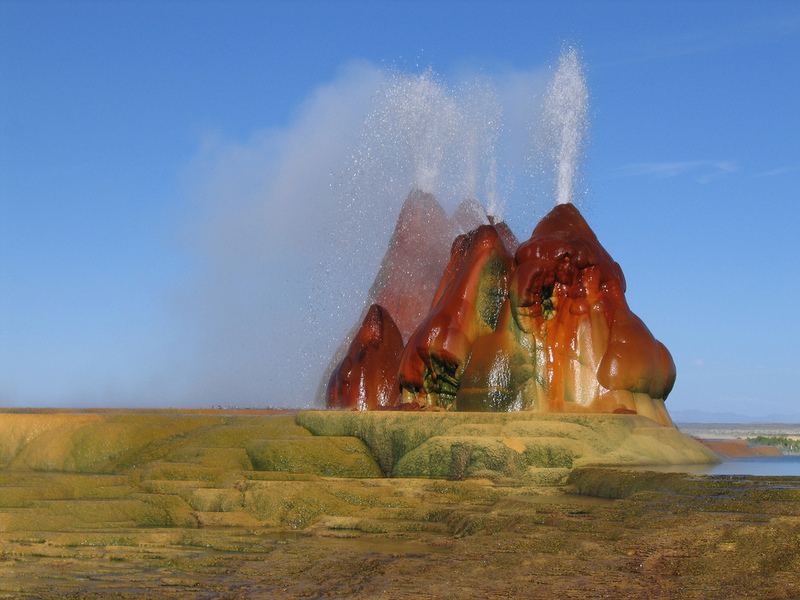 This second man made geyser is now known as Fly Geyser and has grown quite a lot in the last four decades, although it’s cone is not that large, since there are several geyser spouts in the area. However, among the rest of the geysers, this one stands out thanks to its amazing beauty. The minerals contained in the geothermal water were deposited over time, forming a mound that seems out of this world. The intriguing color, with hues of green and red, of the geyser mound is given my the thermophilic algae that thrives in hot and moist environments. The beautiful colors of this magnificent geyser forms somewhat of an antithesis with the violence of the scalding water it releases into the air. Fly geyser continuously spews water into the air, at times sending water 5 feet into the air, reminiscent of a small water volcano. 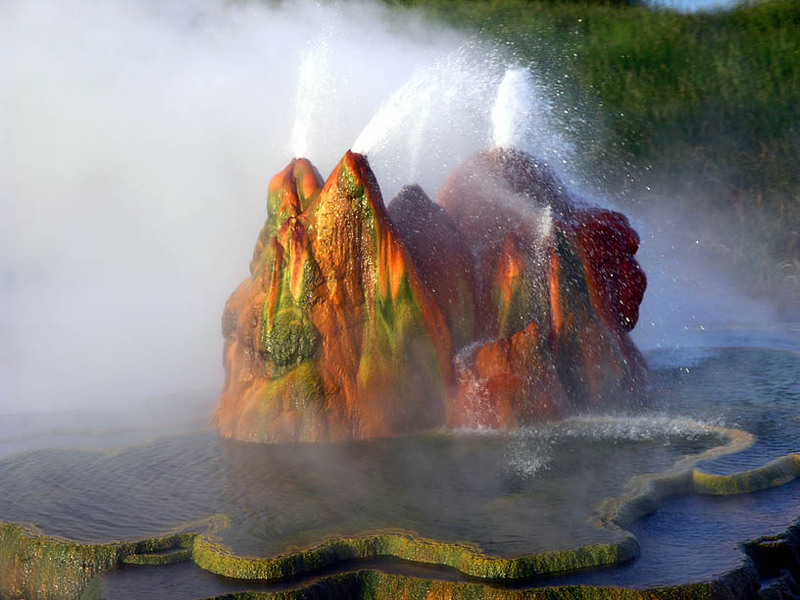 Several terraced pools have formed over time, which gather the hot water that the Fly Geyser spits out. 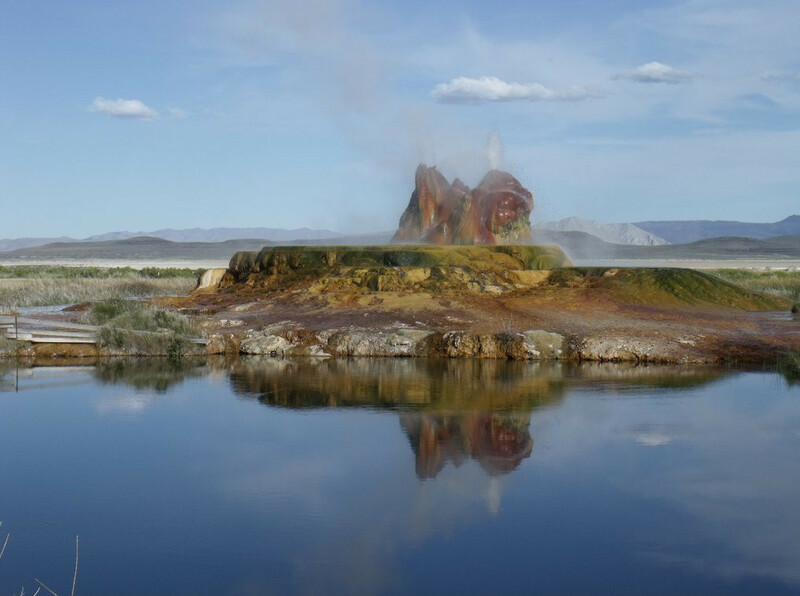 While the Fly Ranch geysers are on private property, meaning that trespassing is illegal, if you contact the owners, they will be more than happy you a day tour of the amazing Fly Geyser, in exchange for a small fee, of course. It is also visible from the road, but since it’s several yards away, you will not be able to fully enjoy this magnificent accident. Thank you Brianna Lopez, for the submission! Enjoyed the images a lot and when reading it’s on private land i wonder how to contact the owner who will open the gate for me? Of course i am willing to pay for that. If you know who to contact i will be more than thankful!